Democratic National Committee Chairwoman Debbie Wasserman Schultz announced Sunday afternoon that she will resign from her leadership position at the end of her party's convention in Philadelphia this week. "Going forward, the best way for me to accomplish those goals is to step down as Party Chair at the end of this convention. As Party Chair, this week I will open and close the Convention and I will address our delegates about the stakes involved in this election not only for Democrats, but for all Americans," Wasserman Schultz, a congresswoman from Florida, said in a statement. The convention kicks off Monday evening in Philadelphia. Luis Miranda, the communications director at the DNC announced on Twitter that DNC Vice Chairwoman Donna Brazile will serve as interim chair through the election in November. Wasserman Schultz has served as DNC chairwoman for more than five years and was the first woman nominated by a sitting president to that position. After she announced her decision to step down, President Obama said in a statement that he called her Sunday afternoon "to let her know that I am grateful" that she had his back for the last eight years. "Her leadership of the DNC has meant that we had someone who brought Democrats together not just for my re-election campaign, but for accomplishing the shared goals we have had for our country," Mr. Obama said. "Her critical role in supporting our economic recovery, our fights for social and civil justice and providing health care for all Americans will be a hallmark of her tenure as Party Chair. Her fundraising and organizing skills were matched only by her passion, her commitment and her warmth." In a statement, Hillary Clinton said that Wasserman Schultz has agreed to serve as the honorary chair of her campaign's 50-state program. "There's simply no one better at taking the fight to the Republicans than Debbie--which is why I am glad that she has agreed to serve as honorary chair of my campaign's 50-state program to gain ground and elect Democrats in every part of the country, and will continue to serve as a surrogate for my campaign nationally, in Florida, and in other key states," the presumptive Democratic presidential nominee said. Wasserman Schultz said she looks forward to serving as a Clinton campaign surrogate. "We have planned a great and unified Convention this week and I hope and expect that the DNC team that has worked so hard to get us to this point will have the strong support of all Democrats in making sure this is the best convention we have ever had," she said. Donald Trump, who officially became the Republican presidential nominee in Cleveland last week, weighed in on Twitter. This comes after 20,000 leaked emails brought into question the impartiality of the Democratic primary process. Sanders had reportedly pushed for a reduced role for Wasserman Schultz during the convention and he has persistently complained that she and the DNC had rigged the primary election for Hillary Clinton. He said in a statement Sunday afternoon that she made the right decision. 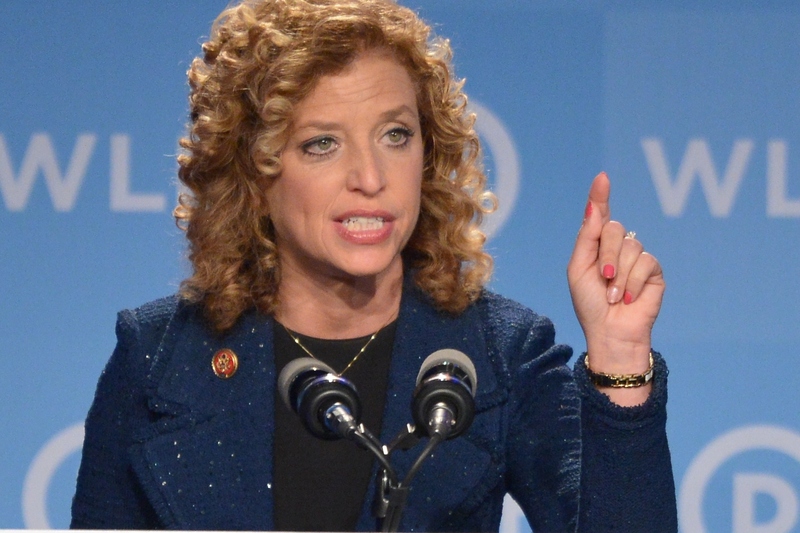 "Debbie Wasserman Schultz has made the right decision for the future of the Democratic Party. While she deserves thanks for her years of service, the party now needs new leadership that will open the doors of the party and welcome in working people and young people. The party leadership must also always remain impartial in the presidential nominating process, something which did not occur in the 2016 race," he said. Earlier in the day, he said it was time for her leadership at the DNC to end. "I think she should resign, period," Sanders said on ABC News' George Stephanopoulos on "This Week." "I told you a long time ago that the DNC was not running a fair operation, that they were supporting Secretary Clinton," Sanders said. "So what I suggested to be true six months ago turned out to be true." The WikiLeaks emails were released the same day as Clinton -- who has been plagued by her own email scandal on the campaign trail -- announced her running mate, Sen. Tim Kaine, D-Virginia. The thousands of emails reveal possible DNC favoritism toward Hillary Clinton, with officials ridiculing Sanders' supporters and even questioning his commitment to his Jewish faith. DNC Chief Financial Officer Brad Marshall wrote one email in May saying, "It might may no difference, but for KY and WVA can we get someone to ask his belief. Does he believe in a God. He had skated on saying he has a Jewish heritage. I think I read he is an atheist. This could make several points difference with my peeps." On CNN's "State of the Union," Sanders briefly addressed the questioning of his faith by some in the DNC. "I am not an atheist," he told host Jake Tapper. "But aside from all of that, I mean, it is an outrage and sad that you would have people in important positions in the DNC trying to undermine my campaign. It goes without saying the function of the DNC is to represent all of the candidates, to be fair and even-minded." The identity of the hackers remains unclear, but Clinton campaign officials say agents of the Russian government hacked the emails and have been leaking them in support of Donald Trump's campaign.